VIZ Media Announces "Record of Grancrest War"
Record of Grancrest War, Vol. 2 (Chapters 7 to 12) finds Theo a young lord with a land of his own. However, the nearby lord of Savis, Lassic David, wants to conquer Theo's young kingdom, so he launches an attack with his powerful mage, Moreno Dortous, at his side. But Theo, Siluca, and Irvin have an ally of their own, Aishela, a warrior and an Artist. The results of this battle with shock. THE LOWDOWN: The Record of Grancrest War manga is an adaptation of the Record of Grancrest War light novel series created by author Ryo Mizuno (who may be best known for the fantasy novel series, Record of Lodoss War). Writer-artist Makoto Yotsuba adapted the Record of Grancrest War novels into a manga that began serialization in 2016, which VIZ Media is now publishing in an English-language, graphic novel edition. 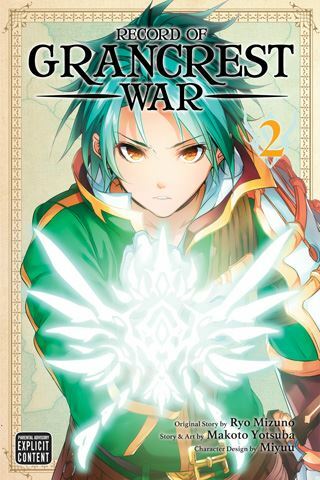 Record of Grancrest War Graphic Novel Volume 2 focuses on building alliances, whereas the first volume introduced a lot of terminology. The English adaptation written by Steven Brown a.k.a. Stan! makes the series easy to enjoy, which is a good thing as the narrative is still in an introductory phase. There are surprises as far as the allegiances are concerned, but this series is still new. I am also still feeling my way around, but this series has promise, enough for me to recommend it to readers. I READS YOU RECOMMENDS: Fans of Record of Lodoss War may want to join the battle in Record of Grancrest War.